This painting has a very special place in my collection and my heart. I knew nothing about Texas Longhorn cattle and their stunning colours before meeting the Longhorns of Ross Ranch. This is probably the most detailed of my paintings with tiny brushstrokes and a multitude of colours. Lilacs, blues, tans and greens are just some of the surprise colours this artwork hides. 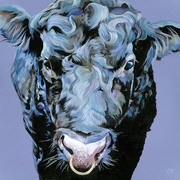 The painting is 70cm x 70cm making it one of the biggest to leave the Lauren's Cows studio and in it's true size you can really appreciate all the hours that went into it. This artwork has a very contemporary composition making it a great addition to a modern home. But what I really love is the sentiment this piece has. 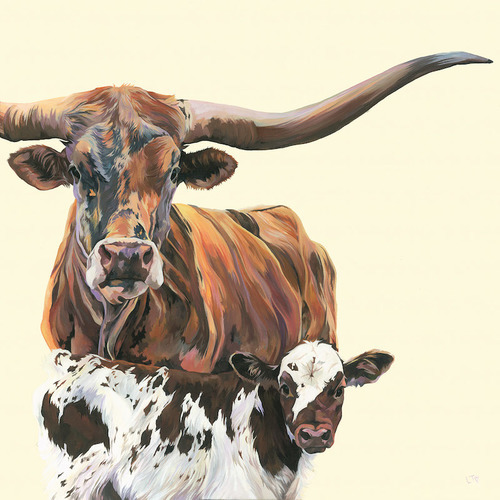 The connection between Dusty and her calf radiates from this painting and when paired with sister painting Like Father Like Son, they capture the importance of family beautifully. Framed in an elegant black frame with gold trim.